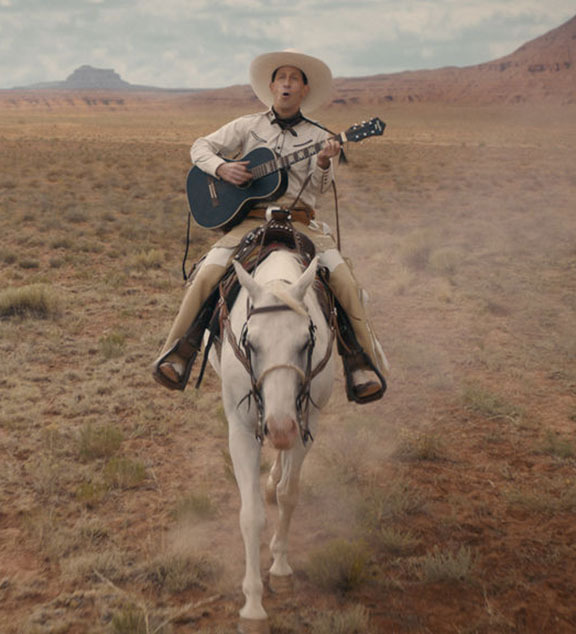 It opens with a full blown parody of Gene and Roy and all those singing Westerns, although it's not really a parody, it's an authentic song, sung ALL THE WAY through, then quickly the scene devolves into a Sergio Leone parody, which gets the biggest laughs and deservedly so. Unfortunately, this is short-lived and we are off on other stories that do not connect. So, the title of the entire film is a sort of false front come-on, which in itself is kind of frustrating and satisfying in a I-sure-didn't-expect-that! way. Get used to it. It is a Coen brothers film, after all. 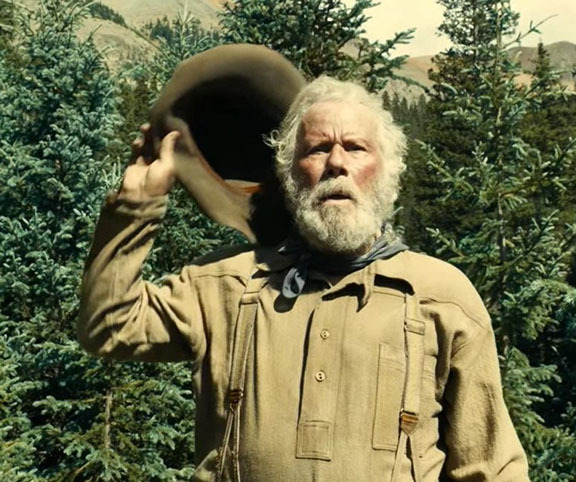 According to an interview I heard the Coens have been writing some of these Western stories for "about 20 years" as stand alone stories without any concern about whether they are commercial, or not. This is a blessing and a curse. The blessing is that none of the stories go where you might think they should go, and the curse is, you will find yourself muttering, "Well, that was a long way to go for a half-assed ending." On the plus side, the Boys get credit for tying the stories together with a throwback to early Old West book covers and artwork. It's an homage to the clean and mean 1920s and 1930s designed book covers with duotone graphics. It gives all the stories told in the movie, a warm bath glow. And we also get a parallel view of the stories as the camera pans out from the first page, then in on the last page as the story ends (it is revealing in the dog story that the ride back to the wagon train is "ten miles" but in the scene, the train is just over the hill. This will make sense when you see it for yourself. 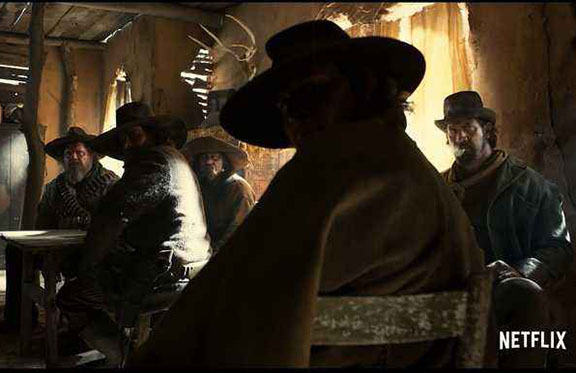 The bar scene with the full blown Sergio Leone Spaghetti Western characters, is my least favorite setup, although it's done well (see the wonderful, grizzled bastards, above). 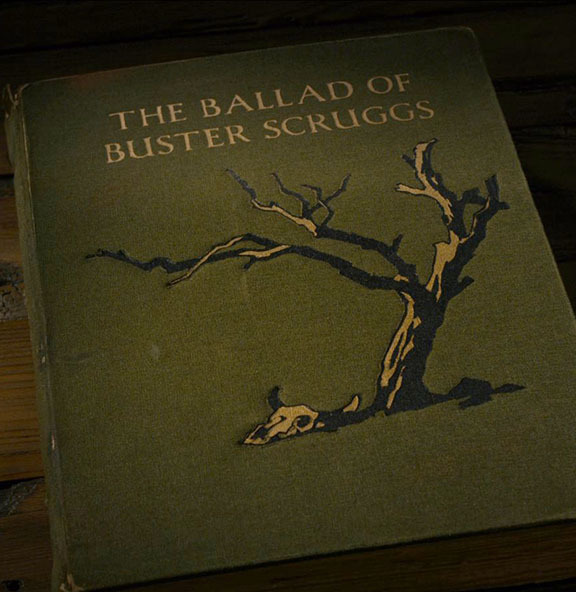 The story with the best arc, is of a prospector whose voice will be familiar to some of you. Plus, the bad guy in this story doesn't have one line of dialogue but it's so obviously Billy the Kid, it's not even funny. The quirkiest story, with the most amazing character is the dog on the wagon train story. 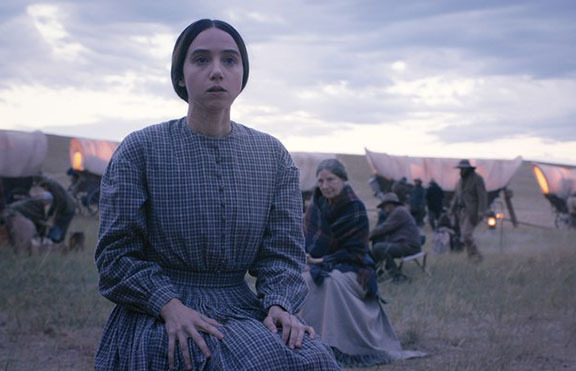 The actress Zoe Kazan is simply amazing in her complex delivery, showcasing insecurity, hope and spilling-over emotion, often in the same scene, and in a few cases, in the same sentence! By far, she is my most favorite character in the whole film. Truly a classic pioneer portrayal with a sober message. There's more, but that should give you enough of a taste to check it out. Oh, and be sure to remind me how wrong I am in all of my appraisals. BUTCH CASSIDY (Paul Newman): Then you jump first. THE SUNDANCE KID (Robert Redford): No, I said. BUTCH: Are you crazy? The fall will probably kill ya! BUTCH: Kid, there's something I ought to tell you. I never shot anybody before. SUNDANCE: One hell of a time to tell me. I photographed Tim some years ago in an episode of Modern Family at a dude ranch in Wyoming. He was a funny and personable fella. He's got to be funny in this. I'll definitely check this out.